Is today over yet? Almost? Oh, good. Because it has *not* been a good day. No particular reason, except I've been stressing beyond belief, trying to get everything ready for our big meeting tomorrow. That meeting, the one where I needed to fix an "American" buffet. So I've been shopping, planning and prepping, doing all kinds of things, including a triple batch of chocolate chip cookies, and blue cheese dip with carrot and celery sticks, and a big bowl of pasta salad as per Jason's suggestion. Main food will be bagels with pastrami - probably not very authentic pastrami, but at least it says so on the package. I hope people will be reasonably happy! And speaking of happy. 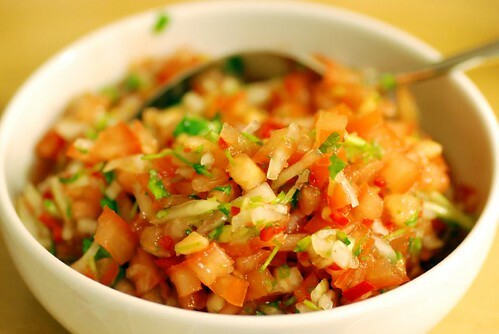 I recently discovered Pico de Gallo, this simple but very bright-flavoured mixture of tomoatoes, onions, lime and cilantro. Oh god, it's so good. I know I'll be making it over and over again this summer because there can be nothing better with barbecue than this. Chop the tomatoes, jalapeño and onion. Let the tomatoes drain off a little in a sieve if they're very juicy. Finely chop the coriander. Mix everything, add lime, season with salt. Simple but oh so so good! My two cents: as with most Mexican salsas, Pico de Gallo gets spicier the longer you let it sit to let the juices soak into the vegetables. I like things spicy, so I would definitely let it sit overnight in the fridge. But many people like it mild, so an hour or so would certainly do the trick. I'm feeling very guilty that I couldn't help with ideas for the American-ish meal. Sorry 'bout that. I'm such a rookie... Sounds like you've got it worked out, though, thanks to input from others. Pastrami WITH bagels is not "American" although pastrami on rye bread certainly is. Hopefully they won't know that, and I'm sure everything will be delicious. :) I'm a big pasta salad fan too. Once you have pico de gallo, all you need for a great meal is some grilled chicken or steak, and some tortillas. Yummy! Good luck with your American Buffet! I hope the pasta salad is a success. I can't wait to get the full review! 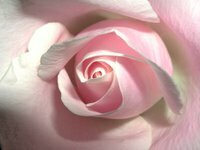 I just discovered your blog and it has made my day! I love your writing style and your insights into food -- and the photos aren't bad either ;) Keep up the great work! 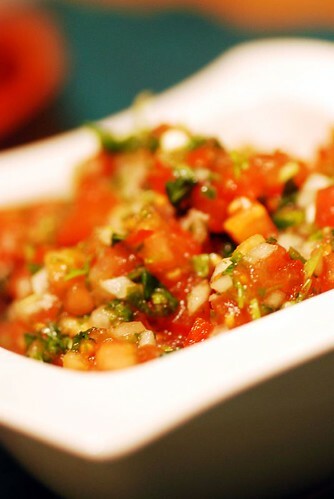 Oh I LOVE Pico de Gallo and you are right - it's simple, colourful and versatile. All those fresh flavours work beautifully with all sorts of stuff including grilled fish and plain grilled chicken breasts. Yum!